2 A.M call and 48 hours later.. The hit song of the year, with 10 consecutive weeks at the top of “U.S Billboard Hot 100” have just set another global record! 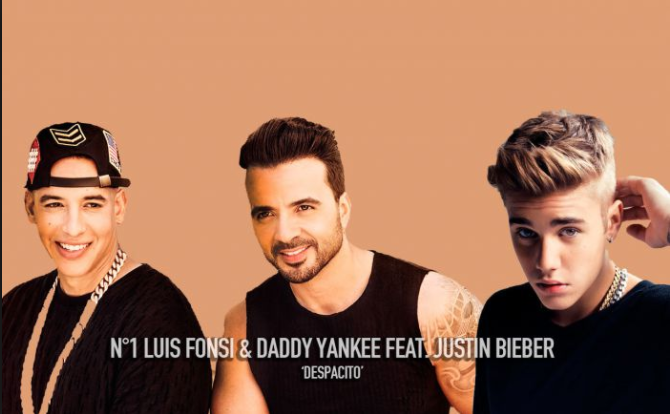 Luis Fonsi and Daddy Yankee’s hit original song and its remix featuring Justin Bieber have now registered more than 4.6 Billion streams across all platforms in just seven months! (January to July 2017). Surpassing the previous record holder, “Sorry” by Justin Bieber which clocked up 4.38 billion streaming. This includes the original and the various remixes according to Universal Music Group Reports. “Despacito” also topped the charts of Argentina, Australia, Austria, Belgium, Bulgaria, Canada, Chile, Colombia, Croatia, Czech Republic, Denmark, Ecuador, Finland, Germany, Greece, Guatemala, Hungary, India, Ireland, Italy, Lebanon, Luxembourg, Malaysia, Mexico, the Netherlands, New Zealand, Norway, Panama, Paraguay, Peru, Portugal, the Philippines, Russia, Scotland, Slovakia, Slovenia, Spain, Sweden, Switzerland, Thailand, the United Kingdom, the United States (other charts apart from U.S Billboard), Uruguay and Venezuela. “Despacito,” translated as “Slowly” in Spanish, hit 5.4 million views on VEVO in 24 hours after it was released on January 13th, 2017, a record by any Spanish-language video. Another Vevo record was smashed when “Despacito” became the fastest Spanish-language video to reach 200 million views, which was achieved in just 22 days. It’s also the fastest ever music video to 2 billion views (154 days). The song was doing phenomenally well, debuting at number 88 on the U.S Billboard chart with millions of audio impression in the Latin Americas and the United State until Justin Bieber entered the fray! In an interview with Vanessa Yurkevich of CNN, Luis Fonsi revealed how Justin Bieber got involved. He was asked about the phone call he received from Justin Bieber and his team, what it was like? So, the already hit song at the time was sent to the stratosphere with a 2 a.m call and 48 hours later, the mega remix was out! Today, the rest is a story! In another Interview with Suzette Fernandez of Billboard, when Luis Fonsi was asked if he doubted the song would be a success. He revealed he nearly not worked on it! Ok, good music they say transcend language, even though this is in Spanish, it does not stop it from tearing the billboard down! We have however fetched you the translation!